Q: Recently, US National Security Adviser John Bolton said that China is poised to take over Zambia's national power and utility company in order to collect on Zambia's financial obligations which are worth $6 to $10 billion dollars. In response to this, Zambia's presidential spokesperson Amos Chanda said that the figure of between $6-10 billion given by Bolton was wrong. He added, "it is regrettable that such information can come from such a high-ranking official. In fact, the power company is not within the scheme of Zambia's debt to China". What is your comment? A: I have also seen relevant reports. You may share the same feeling with me that this is not the first time for US officials to be slapped in the face on such kind of issues. We hope that they can learn lessons from that, reflect on themselves and refrain from having a loose tongue in the future. Q: US National Security Adviser John Bolton in his recent speech on the US new Africa strategy said that the ultimate goal of the Belt and Road Initiative is to advance Chinese global dominance. What is your comment? A: We have said many times that the Belt and Road Initiative proposed by China is an initiative for international economic cooperation which has nothing to do with geopolitics, let alone a strategic tool for competing with others. The goal of jointly advancing the Belt and Road Initiative is to inject new impetus into the world economy, promote the common development of all countries and alleviate the imbalance in development through the equal-footed and mutually beneficial cooperation of all relevant parties. During the past five years since its inception, the Belt and Road Initiative has been widely supported and participated by the international community and achieved remarkable outcomes. Many developing countries, including the African countries, have taken an active part in the Belt and Road Initiative and a lot cooperation projects have taken root and borne fruits in Africa, which has greatly improved the welfare of the African people. These cooperative partners are in the best position to make comments on the Belt and Road Initiative. Actually, leaders of some African countries have already made clear their position on it. When conducting cooperation with other developing countries, China always follows the principle of amity, sincerity, mutual benefit, inclusiveness, real results and good faith, never interferes in the internal affairs of these countries and attaches no political strings. The international community has a fair judgment in this regard. We hope that the US and other countries can view China's cooperation with African countries and other developing countries in an objective way. It is advisable for them to provide tangible assistance to the developing countries as China has done rather than make irresponsible remarks with tinted glasses. Q: On December 15, the second China-Afghanistan-Pakistan Foreign Ministers' Dialogue was held in Kabul, Afghanistan. The three sides also signed a MOU on Counter-Terrorism. Do you have more information to share? 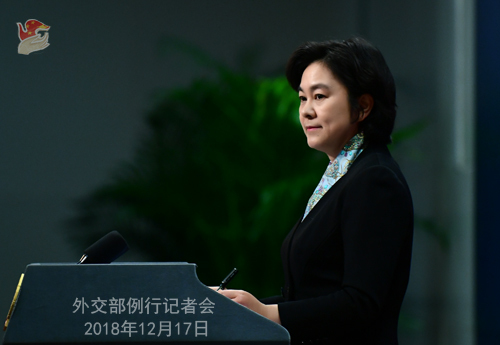 A: On December 15, State Councilor and Foreign Minister Wang Yi, after attending the second China-Afghanistan-Pakistan Foreign Ministers' Dialogue in Kabul, gave a joint press conference, during which he briefed the journalists on the consensus reached by the three parties in the following six aspects. First, enhancing trilateral cooperation is highly relevant to promoting the common development and safeguarding the common security of the three countries and upholding peace and stability of the region. The three sides agreed to make the best use of the Foreign Ministers' Dialogue as well as the strategic dialogue, counter-terrorism and security consultation and practical cooperation dialogue under this framework to step up communication and coordination and plan for and advance trilateral cooperation in various areas. Second, the three parties are willing to strengthen coordination, seize the important opportunity facing the reconciliation process in Afghanistan and strive to bring the Taliban back to the negotiating table at an early date. Afghanistan is willing to continue to advance the previous peace initiative and endeavor to restart the peace talks. China and Pakistan firmly support the Afghan-led and Afghan-owned reconciliation process as well as Afghanistan's principal role and will continue to leverage their respective strengthens to play a constructive role in this aspect. Third, Afghanistan and Pakistan agreed to further improve their bilateral ties and promote good interactions in such areas as politics, military, economy and security. They are committed to resolving differences through friendly consultations. As for those differences that cannot be addressed for the time being, the two sides should properly manage them so as to avoid impacting the improvement of their bilateral ties. As a friend to both Afghanistan and Pakistan, China appreciates this and stands ready to provide support and assistance for them to improve bilateral relations. Fourth, the three countries agreed to boost trilateral cooperation. In addition to such "soft" projects as exchanges between and training of personnel, we will vigorously explore such "hard" projects as livelihood and transport infrastructure. Fifth, the three parties agreed to jointly advance the Belt and Road Initiative and promote the connectivity and economic development of the region. Both China and Pakistan support Afghanistan in leveraging its geographic advantages to serve as a hub in connecting all countries in the region and benefiting from the China-Pakistan Economic Corridor and other regional cooperation projects. The three parties agreed to expand trilateral cooperation under the framework of the Belt and Road Initiative. Sixth, the three sides agreed to earnestly implement the MOU on Counter-Terrorism inked during this Dialogue, strengthen dialogue on counter-terrorism policies, promote counter-terrorism practical cooperation, step up counter-terrorism exchanges and cooperation under multilateral frameworks and firmly crack down on terrorist organizations such as the East Turkestan Islamic Movement. China will provide support and assistance for Afghanistan and Pakistan to advance counter-terrorism cause and step up counter-terrorism cooperation. This China-Afghanistan-Pakistan Foreign Ministers' Dialogue is successful. We are willing to maintain close communication with Afghanistan and Pakistan to implement the relevant consensus reached at this meeting. Q: The Canadian government said that their diplomats here have now been granted consular visits to both of them. Can you give us more details on these meetings? Where did they take place? Do you have any further details on the crimes they might be suspected of? Can you tell us where they are detained and what their health conditions are? A: Last week, my colleague Lu Kang has answered many questions you raised about this matter. The relevant situation is very clear. Compulsory measures have been taken on these two Canadian citizens in accordance with the law on suspicion of engaging in activities that endanger China's national security. Regarding these two cases, China and Canada maintain unimpeded consular communication. The Chinese side arranged for the Canadian personnel to conduct consular visits to the two persons in accordance with the law, and provided necessary assistance for the Canadian side to perform normal consular duties. At the same time, the legal rights of these two Canadian citizens are also guaranteed. Q: A New York Times report said that an international manufacturing certification organization will be looking into possible forced labor in Xinjiang. What is China's comment? 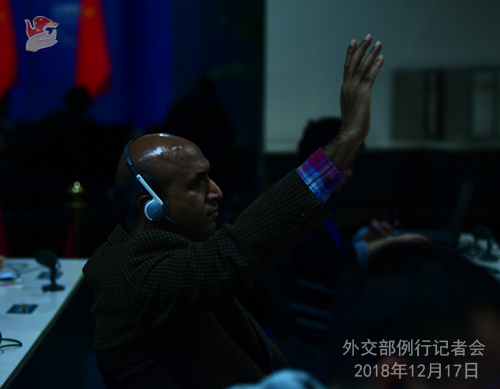 A: I have not seen the report you mentioned, but I noted that now foreign media have untrue reports on the vocational education and training centers in Xinjiang. I hope that the media can report and view the relevant issue in a objective and all-round manner instead of levying groundless accusations against China based on speculations and hearsay. Q: What outcomes have been reached at the just concluded 2018 UN climate change conference (COP24) in Katowice? What is the significance of this meeting? What role did China play? A: On December 15, the 24th Conference of the Parties to the United Nations Framework Convention on Climate Change wrapped up in Katowice. Following two weeks of in-depth negotiations, the conference adopted a package of rules on the implementation of the Paris Agreement as scheduled, making further arrangements on comprehensively implementing the Paris Agreement and stepping up global climate action. This COP24 in Katowice is an important meeting in the global climate governance process. Relevant parties of the international community have made positive efforts to help the meeting achieve comprehensive and balanced outcomes. The meeting successfully conveyed the positive message of adhering to multilateralism and strengthening global action, boosted parties' confidence in the climate governance multilateral mechanism and provided new drivers for various parties to promote global governance and move towards global green and low-carbon development. The Chinese government has always taken combating climate change as an inherent requirement to realize sustainable development and part of the responsibility for building a community with a shared future for mankind and been actively engaged in global cooperation on climate change. On the eve of COP24 in Katowice, President Xi Jinping at the G20 Buenos Aires summit called on parties to continue to provide political driving force for international cooperation on climate change with a sense of responsibility for building a community with a shared future for mankind, which demonstrated China's support to COP24 in Katowice and provided key political guidance and driving force for the success of the meeting. China, France and the UN co-hosted a climate change conference and reaffirmed the firm commitment to implementing the Paris Agreement, which sent out a positive signal to promote international cooperation on climate change. 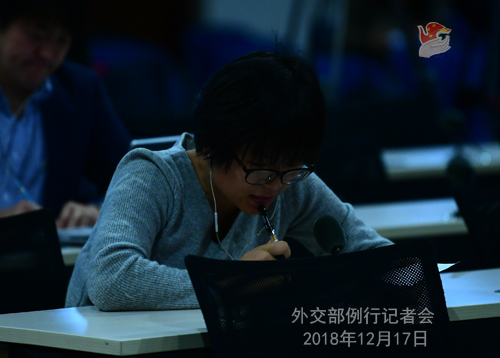 At the COP24 Katowice meeting, the Chinese delegation was deeply engaged in consultations on various issues for discussion and actively communicated with parties with a positive and constructive attitude, making key contributions to bridging differences between parties and ensuring the success of the meeting. The conclusion of the implementation rules for the Paris Agreement has laid a solid foundation for its implementation and opened up a new era for cooperation on global climate change action. China stands ready to join hands with other parties to play a constructive part in the global climate multilateral process, effectively implement the rules for the implementation of the Paris Agreement and promote the global green, low-carbon and sustainable development. Q: What did you mean by saying untrue reports? Can you tell us what specific reports you are referring to? A: I have not seen the report you mentioned, but I noted that recently foreign media have made some false reports on Xinjiang which are totally based on hearsay and rumors that are fabricated out of thin air. 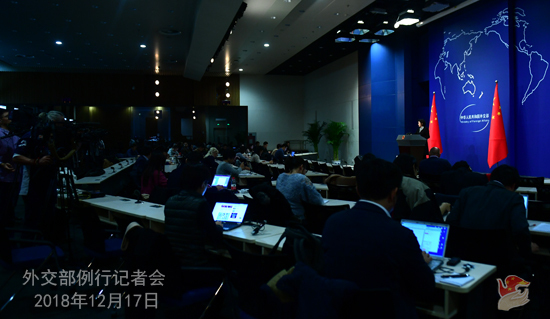 We believe that the international media shoulder the responsibility to present the true picture of China to the rest of the world. We hope that the relevant foreign media can report the true situation in the Xinjiang Uygur Autonomous region and other places in China in a more active, all-round and objective fashion. We are willing to continue to maintain good communication with foreign media and better help you to learn about the true situation. Q: On Friday, the Canadian Foreign Minister and Defense Minister held a "2+2" ministerial dialogue with the US Secretary of State and Secretary of Defense in Washington D.C. 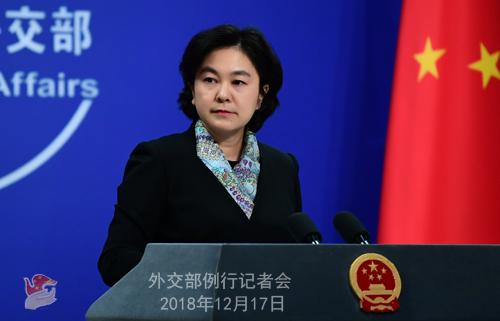 When speaking of the detention of the Chinese executive, the Canadian Foreign Minister said that "Canada was acting with its treaty commitments and in line with the rule of law, and both the US and Canada uphold the rule of law and rules." US Secretary of State Pompeo said that "the unlawful detention of two Canadian citizens is unacceptable. They ought to be returned." What is China's comment? A: As for Canada's illegal detention of Chinese citizen at the request of the US, my colleague has answered a swarm of questions from reporters and clarified China's stern position last week . What I want to say is, after all these things that have happened, it is surprising that the United States and Canada are still praising themselves as law- and rules-abiding countries. In my opinion, this is nothing but a modern version of "The Emperor's New Clothes." Whatever dignified excuse they may use or whatever "legitimate" cloak they may try to put on, they will be ridiculed for all these flagrant disregard for facts and the contempt of the rule of law. In the past few days, many Canadians with a sense of justice have written to the Chinese Embassy in Canada or spoken through the Canadian media to publicly criticize the Canadian side for being unreasonable and illegal. Many people in the US, including the well-known economist Jeffrey Sachs, also sharply pointed out the essence and consequences of this matter in a published article. The Chinese side strongly urges the Canadian side to immediately correct its mistake, release the relevant Chinese citizen and effectively safeguard her legal and legitimate rights and interests. We also strongly urge the US to immediately withdraw the arrest warrant against the relevant person.